The New Reality brings with it a new and expanded vista of awareness. In order to operate successfully in the new environment, you need to apply the new principles which come with that expanded vision, with that greater vista of reality. This empowers you to awaken to your expanded potential and to manifest it. Metaphysics is a philosophy of being, a study of the underlying principles of existence. The holistic approach to metaphysics provides a philosophy based upon an integrated foundation of mind, body and spirit. This spirit-inclusive approach is essential in order to understand the wider vista of consciousness which the New Reality presents. Without the spiritual component of metaphysical philosophy, the mysteries of life remain forever mysteries. Life did not evolve accidentally from a pool of prehistoric sludge; it was brought into being by the precise intention of the Creator. The key to understanding the grand design of life is, therefore, to seek to understand more about the workings of its designer. If, for example, you had never seen a jet aircraft and, suddenly, one flew overhead, you might wonder if it was propelled by that loud noise that it makes. The real answer, however, can be better found in the designers’ office at the aircraft factory, and so it is with life. If you think about how the designer of the universe could have achieved something, then you will find answers much more quickly than if you wonder how such an ‘accident of evolution’ could have happened. Why did the Creator create life as we know it? How did it go about that task? What are the underlying principles that we can learn from this? The greater vista of the New Reality enables us to clearly comprehend principles which, before, were mysteries. Here are ten such principles which will help you appreciate the expanded vista of consciousness offered by the New Reality. Everything in Creation is an expression of Infinite Being. Infinite Being is the all-encompassing consciousness from which the universe was created. Everything in the universe is made of consciousness. We are all aspects of Infinite Being. The world is experiencing a spiritual transformation of human consciousness. It may take many decades to complete, and, when it does, it will bring an end to global strife and suffering. This new era of civilization will be achieved by a widespread awareness of the underlying unity of all people. The world is changed when you bring about spiritual change within yourself. This occurs automatically as you constantly share who you are, and all that you have become, within the shared atmosphere of the global mind belt. Just as each snowflake is unique, so is each person. Your primary purpose in life is to experience life from one individual, unique point of view. You are an expression of Infinite Being as it experiences itself from all possible viewpoints. Life reflects who you are – your beliefs, your thoughts and your feelings. This is the basic principle behind the teaching of karma and the fact that you reap what you sow by creating a pattern of thought that attracts like experience to itself. Reflectance is often delayed while your circumstances adjust to allow appropriate reflections to manifest. You create your own reality and take personal responsibility for it. Your life is a reflection of who you are and the experiences that you, as a soul, planned for this life. From the point of view of your true, inner personality, passing away from the physical realm is like stepping out of a suit that you have worn for a while. The suit is not the real you. In your spirit body, you move into the spirit realm, which is a place of joy and healing. After meeting friends and relatives who have passed on before, you start work on resolving any issues which caused inner conflict in your physical life. You remember more about who you really are and experience a joyful reunion with the rest of your immediate and extended soul family. Reincarnation exists to provide a variety of experience, so that life skills may be gained, and so that, while in a physical body, you can rediscover your spiritual source within. The ultimate truth is to be found within, yet the study of a variety of sources of information helps you to reawaken and remember your inner truth. Unconditional love and the acceptance of all life puts your awareness into a higher place, allowing understanding and compassion to develop. This love and acceptance of others is a recognition of the spiritual light within those people and is not dependent upon their outward behavior. Unconditional love also includes a general respect for the beliefs of others, regardless of how much they may, or may not, align with your own beliefs. 10. Inner connection and insight. Inner connection with your spiritual source promotes spiritual transformation and the achievement of your true potential. Developing intuition, both in men and women, provides an essential insight into life’s experiences. *Owen Waters is the author of Freedom of the Spirit: Four Powerful Steps to Spiritual Freedom. This entry was posted in Metaphysics, Owen K Waters, Spiritual, Spiritual Metaphysics on April 12, 2019 by Owen K Waters. In their 1996 book, Spiral Dynamics, social scientists Don Beck and Christopher Cowan identified eight stages of cultural evolution in the human race, ranging from caveman to global thinker. Each stage upon this evolutionary stairway brings a better life than the one before and, eventually, its own reason for people to want to migrate to the next stage. The authors called these stages “memes” and labeled each one with a meaningful color. Beige is the color of the savanna grasslands in the cradle of civilization. Beige is the foundation meme. It relates to individual, basic survival, with a focus directed towards just staying alive. With this meme comes constant uncertainty. Eventually the search for food becomes more difficult, prompting people to step into the next meme, or mode of reality. Purple, the decorative color of royalty. Clans form under the purple meme for mutual protection. Tribal and family bonding is all-powerful, along with superstition-filled attempts to understand the powers of nature which threaten to overpower the clan. Magical rituals are invented to protect the clan by appealing to the spirits of nature. When the rituals eventually become stifling, the more powerful individuals in the clan branch out into the next meme. Red, the color of hot emotions, even rage. Beginning some 10,000 years ago, this meme sees powerful individuals compete in an intense survival of the fittest. They seek to master the environment, dominate other people and break away of individual constraints. They sense many gods, which are worshipped as models of power. Eventually, chaos and anarchy reign supreme. Then the culture is ready for a higher authority to take charge and control the chaos. Dictators take power by the sword, and usually, a short time later, dying the same way. When an enlightened form of dictatorship finally takes control, the doorway to the next meme is opened. Blue, as in “true blue” conservative. First seen some 5,000 years ago, this meme brings order out of chaos and establishes rules of morality, which are used in a righteous fashion to stop anarchy. By obeying authority and sacrificing the self to a greater cause for a deferred reward, people find a purpose in life within the constraints of this meme. A judicial system is set up which protects people from red-motivated predators. Allegiance is declared to the one supreme ruler and to the one supreme God. When this absolute order eventually becomes oppressive and repressive, individuals grow weary of waiting for the dispensation of rewards from the hierarchy. Finally, they break free to seek their own rewards under the next meme. Orange, the color of radiant energy and productivity. This meme has been explored for several centuries, especially since the Renaissance. Under this meme, people strive to succeed and also to keep in style with the current fashions and technical toys. People are willing to fight to beat the competition and achieve independence. Eventually, when material progress fails to bring happiness, orange meme people become lonely. They seek after community and a sense of caring within the next meme. Green, like green politics and ecology. Many advances in democracy over the last 150 years had their philosophical foundations in green thinking. Along with the green meme comes community, caring and a sharing of society’s resources among all. This liberates humans from greed and dogma, and, ideally, refreshes a sense of spirituality. Cooperative ventures rise across the land and in the workplace. Unconditional love can flourish as people learn to accept others as they are, and to see the value of service to others. Consensus-seeking is a very time-intensive occupation. Also, the productive members of this culture struggle to earn the money to pay for the system. As an ever-growing mass of people qualifies for entitlements which had been promised during more idealistic times, the system can come to be stressed under the pressure of its own weight. From here, people move to the next meme seeking a form of individual empowerment which incorporates all that has been learned from the first six memes. Memes come in sets of six, so meme number seven is actually the first one in the second tier of six memes. With this second tier of memes comes freedom from all of the fears of the prior memes, and, finally, the freedom for human cognition to focus upon its possibilities in the world. As the first meme in the second tier, meme number seven resonates to the first (beige, survival) meme in tier number one. However, it expresses itself at a higher level, one which incorporates all of the lessons of memes one through six. In meme number seven, people act from an inner-directed core. Yellow is an enlightened color, reminiscent of natural, clean solar power. Active since the late 1940s, the yellow meme causes people to start to think in terms of whole systems, seeing big-picture views of reality. Under this meme they discover a self-accountable style of personal freedom, one without excessive self-interest or harm to others. Yellow is a powerful meme in promoting the exploration of the greater possibilities of life. It creates networks of information and people which easily adapt to changing needs. Yellow meme people can interact with people of the first six memes and speak their psychological language. Yellow respects others’ world views and unique habits, customs and cultures, even though they don’t necessarily agree with them. Yellow brings a high sense of self-esteem based upon information as much as emotion. This enlightened self-acceptance acknowledges and accepts their own shortcomings and faults as mere stages along the way to acquiring more skills. Turquoise, the color of oceans globe-spanning oceans viewed from space. A child of the 1960s, this is a meme with a global view, even larger than the whole-system view of yellow. Turquoise opens up spiritual awareness, a willingness to be reflective, and an awareness of intuition and a trust in the insights which intuition provides. Turquoise meme people learn through simply being as well as through doing. Their work must be meaningful to their holistic, unified body-mind-spirit view of life. Spiritual bonds form under this meme, transcending old barriers and bringing diverse people together for common purposes. Turquoise has a global village outlook, and seeks out projects and solutions that will work well for the whole planet. Its power to integrate can resolve paradoxes, such as being fair to all school students while helping the brightest to shine and the most challenged to grow. It has a faith that everything somehow connects to everything else. Turquoise discovers a new version of spirituality – one stands in awe of the vast, cosmic order. The authors of Spiral Dynamics have identified, as of the 1990s, meme number nine. They call this the Coral meme, but they did not yet have an analysis of for what it might stand. However, if second tier memes are reminiscent of their first tier cousins, then meme number nine will be like meme number three, only in a higher degree of manifestation. Meme number three was red, the meme of adventure, exploration and mastery of the environment. As the second tier memes have a spiritual component, this means that coral will be an adventure into the abilities of the spiritually-directed mind. The new, coral meme will explore the spiritual use of the power of the mind to transform reality in the world. Its major demand will be for spiritual and creative freedom on a global basis. This far-ranging and inspired meme has the power, quite simply, to entirely transform the world as we know it. In my 2005 book, The Shift: The Revolution in Human Consciousness, I correlated the twelve memes with the twelve faces of the human chakra system. This allows the nature of the mystery meme – and the other three, as-yet undiscovered memes – to be predicted based upon the functions of the higher chakras. The Shift: The Revolution in Human Consciousness was updated in 2016 and is available for immediate download. This entry was posted in Owen K Waters, Spiritual Metaphysics on February 17, 2019 by Owen K Waters. In order to understand the nature of evil, it is more revealing to study its underlying nature and then translate that into physical reality. In a universe filled with love and light, both of which are freely available to all, the universal flow passes through people, empowering them as it passes. However, some people try to keep as much love and light as possible for themselves, interrupting the natural flow. This act of restricting or stopping the natural flow produces a tell-tale appearance of darkness in the aura of that person. A person’s aura can be seen by a clairvoyant, or by anyone else with enough practice. However, you don’t have to practice seeing auras in order to know what is in them. Everyone senses the auras of others and reacts according to the meaning of that which they sense. Intuitively, you know everything you need to know about a person when you first lay eyes upon them, or even upon their photograph. Is there, for example, a secret agenda behind the words that a certain person is speaking? Here, a little inner sensitivity goes a long way in providing such answers. The human aura is an envelope of etheric energy surrounding the body. Etheric energy is pre-physical energy, more subtle than the electromagnetic energy which makes up physical matter. In the spirit realms, which you visit each night as your body sleeps, etheric energy can be plainly seen as a subtle light which illuminates the environment. Etheric energy also makes up the subtle matter from which your astral or spirit body is composed. 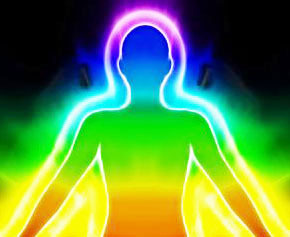 The aura reflects the thoughts and emotions of the person through colorations in its appearance. Dark, dense colors mean an absence of love and light. The light referred to here is etheric light, not physical light. Cold is the absence of warmth. Ignorance is the absence of wisdom. Evil is the absence of light. Love permeates everything. The universe, and everything in it, was created by three fundamental principles of original consciousness – intent, love, and motion. Love is the medium that fills the envelope of the universe while Divine Intent provides the energy for its active function. Divine Love is in the air. It even fills the apparent emptiness of space. It is the fabric of the universe and it is a mere thought away at all times to those who open their hearts to this all-pervasive consciousness. The antidote to fear is love, and there is no lack of love in the universe. The untangling of established, fear-inducing beliefs can be a challenge. In this case, meditation should be used to find your inner balance and discover the common sense that enables such beliefs to be dissolved. If you have a stubborn, fear-based belief that persists because it seems correct based upon the facts, ask your inner self to heal that fear. Your inner self is your soul and, despite claims by worldly, outside parties, your soul is your best connection to true, spiritual guidance. When it comes to personal decisions about life, your soul knows you better than anyone in the outside world does, so why go to anyone else for personal advice? You should be aware that your spiritual power fills your aura, turning it into a force field of defense against those who might try to intrude into your personal space in order to gain some type of advantage. So, at the end of a daily meditation session, pay attention to the aura surrounding and permeating your body, then visualize it being filled with the love and light of the universe. When you visualize your aura being filled with the love and light of the universe, not only will it make your day unfold with smooth synchronicity, it will make people of dubious intent want to keep away from you. This is because auras filled with light disturb people with dull, dark, unimaginative auras. They just won’t like being around you. When you radiate light and unconditional love, other people with good hearts are magnetically attracted to you. After all, like attracts like, even in the physical world, so why not be surrounded by friends with simply wonderful hearts? This entry was posted in Metaphysics, Owen K Waters, Spiritual Metaphysics on November 24, 2018 by Owen K Waters. Whenever you step firmly into heart-centered consciousness, your awareness immediately becomes more connected to your inner source of intuition. Through intuition, you become aware of information about people, places and events that springs from the essence of those people, places and events. This information is not delivered through the outside senses, although it may unfold within you at the same time that you receive sensory information. While visual information relates only to the sense of sight, intuitive information includes much more. It includes all sensory information – sight, hearing, touch, smell and taste – and, in addition to that, the thoughts, feelings and memories that are relevant to the situation. First impressions are more than just visual. They are intuitive as well. When you are about to meet a person for the first time and you are approaching them, you will receive a visual impression and your consciousness will also receive impressions about the nature of their consciousness, such as their true emotional state. That intuitive stream of information will come into your awareness alongside the visual stream and, if you are aware that it exists, you can add the intuitive information to your conscious impression of the person. 1) Be aware that it exists. 2) Be open to receiving it. The more you practice having an openness to intuitive information, the more this will develop. Most people are not aware of their mental and emotional transmissions. In a crowd of people, these transmissions add together and there is as much mental noise as there is physical noise. As you become more in tune with your inner senses, you will find that, on some occasions, it’s better not to access your intuitive information for a time, just to give yourself some peace from the volume of mental noise. At night, when you travel out-of-body in the spirit realms, communication is different than when you are awake in your physical body. The natural method of communication in your spirit body is to exchange information with others via thought. In the spirit world, people naturally know when to open for a communication and when to close down their thought transmissions again. There, you sense when a person ‘opens’ to you and sends a mental greeting, or when they are ‘closed’ and not offering any communication. In daily life, first impressions are intuitive as well as visual. The reception of such information is automatic, but the conscious mind misses this information feed when it is focused entirely upon the external world. Be more aware of your own intuitive information. Be open to it. Then, it will flow right into your conscious mind along with the visual information that your conscious mind is receiving. Owen Waters is the author of Love, Light, Laughter: The New Spirituality. This entry was posted in Owen K Waters, Spiritual Dynamics, Spiritual Metaphysics on November 17, 2018 by Owen K Waters. In Part I, I pointed out that a curtain of forgetfulness is drawn across our consciousness each time we awake from sleep. Because our nighttime adventures typically occur in the fourth-density spirit world, which is a more subtle realm than our third-density physical world, our nocturnal activities are more vivid, more alive, and more real than anything that occurs during the day. Because the spirit world is where the population of the afterlife lives, you often meet friends and relatives there who have passed on from the physical world. Nighttime can be a wonderful time of reunion with such dear friends, so it’s well worth making the effort to increase your dream recall ability. Your spirit body naturally resonates to the spirit world. Once freed from the physical shell each night as your physical body falls asleep, it will normally move upwards from the physical third-density world towards the light of the fourth-density spirit world. Upon arriving, you will notice extra light everywhere: It fills the air and it radiates outwards from solid objects. This is because material in the spirit realms is made of etheric energy, which is a higher energy than the electric energy that forms physical matter. The air in the spirit world is filled with etheric energy, ready to be drawn into some useful form by the intent of any individual. People in the afterlife can build a new home just as fast as they can visualize every part of it. It will stay in existence as long as they pay it occasional attention. If they want a little variety in the appearance of their new home, they can even redecorate it every day! If they leave and move elsewhere, the house will slowly dissolve, over a period of months, back into the atmosphere as etheric energy. The fact that people who live in the spirit realms create homes does not exclude you, the temporary nighttime visitor, from doing the same. In fact, having a private retreat somewhere in the spirit world is a wonderful help in recovering from the stresses of daytime physical living. There is plenty of space in the spirit world for you to find a quiet, private location for your retreat. One of the curious properties of the spirit world is that you can actually create your own space, fill it with objects of your own design, and it will be something that no one else would perceive unless they tuned into your thought pattern as the creator of that scene. It can even be large enough to include your own idea of an ocean scene with a perfect, setting sun. It won’t be the actual Sun; it’ll just be your own, private, artistic creation built for your own enjoyment, and it will last for as long as you pay occasional attention to it. 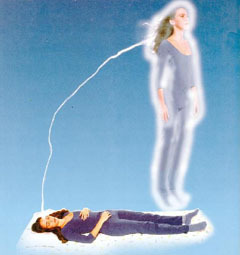 The spirit or astral body is quasi-physical. This means that, while it is subtle and etheric compared to the physical body, it is still solid in its own environment. In the spirit realms of 4D, matter is composed of etheric energy and is solid to the touch. If you bump into another spirit or astral body on your travels, they will seem solid, just like bumping into another person in the physical world. The fact that spirit matter is less dense than physical matter gives you a lot more freedom of movement. You can meet a friend halfway around the world in one or two seconds of travel time just by projecting your spirit body to that new location. You tune into that person and, wherever they are, mentally project, and you will appear at that location. A simple intention is all it takes to decide what each night’s adventure can be. Then, upon awakening, you’re halfway to remembering what happened. 1. Go and see friends and relatives who have either passed on or, just like you, are temporarily out-of-body for the night. 2. Notice how the 4D air is full of energy and materialize solid objects either just for fun or for artistic development. 3. Find a piece of land away from it all and build a small retreat there. 4. Decide who or where to go and see in a distant location, gather your intent, and project there instantly. Keep a notebook and pen right beside your bed and some source of light (even a flashlight will do.) Get in the habit of recalling dreams as soon as you awake and writing down everything you can. You’ve just returned from another world to a brain that’s had the night off, so those memories will begin to fade fast as soon as you wake up. Seconds count in writing down those dream details. Realize that the immediate dreamstate is shallow compared to full immersion in the spirit world. The easiest dreams to recall are the ones that occur when you are almost ready to wake up. They are typically dramatic scenes filled with symbols that help you integrate the stresses that you have felt in previous days. The key to understanding them is to ask what each symbol means to you emotionally. Then, you’ll understand the stress that was being worked out in the dream, or the message that your inner being was bringing to the surface for your attention. As you become more practiced in dream recall, you will soon reach beyond the initial dreamstate and remember the deeper, real-life experiences that you have each night in the spirit world. The good news is that today, due to ongoing effect of The Shift, the veil is thinning between the 3D physical world and the 4D spirit world. As each year passes, people are remembering more and more upon awakening. You may sometimes find yourself between wakefulness and sleep and you are really not sure which state you are in. Today, this is quite common due to the thinning of the veil. As The Shift continues, physical matter will move fully into 4D, there will be no veil and full recall will be easy. Owen Waters is author of The Shift: The Revolution in Human Consciousness. This entry was posted in Owen K Waters, Spiritual Dynamics, Spiritual Metaphysics on November 10, 2018 by Owen K Waters. Other than a few remembered dreams, our nighttime slumbers seem to be one big twilight zone of consciousness where nothing much happens at all. A curtain of forgetfulness is drawn across our consciousness each time we awake from sleep. What really happens at night is actually more vivid, more alive, and more real than anything that happens during the day in the physical world. At night, we travel in a more subtle world than the physical one. Human consciousness has many ‘bodies,’ or shells of consciousness, each of which functions at a different level of awareness. The more dense bodies used by each human being are the physical body, its etheric energy counterpart, and the astral or spirit body. The less dense ones begin with the soul ‘body,’ which is a nonphysical field of consciousness that exists beyond the limitations of time and space, and then go on up the frequency scale of consciousness from there. To understand where these bodies fit into the grand scale of universal consciousness, realize that there are 12 density layers of consciousness. Some people refer to the different density layers as ‘dimensions.’ As physical beings today, we exist in third density and are in the process of transitioning into fourth density. Fourth density has been traditionally the home of the spirit realms. It still will be after The Shift to higher consciousness has been completed, but the spirit realms will move up to higher sub-layers within fourth density as the physical realm moves in. The spirit realms are referred to in the plural as there are many sub-layers of consciousness within fourth density. The spirit or astral realms are also known as the afterlife. They vary from the lower astral realms, through the highly-populated middle realms, and on into the higher astral realms or heavens. When you eventually pass on from the physical realm, as we all do eventually, you will find yourself located in the exact spirit realm that corresponds to your normal frequency of consciousness. If you have strong issues to resolve, they will hold you back a little until you have worked through them by a process of integration. The whole experience of the afterlife is dedicated to the integration of whatever issues of separation were generated during a person’s physical lifetime. If they became polarized against a particular person, i.e. grew to hate them, then they will learn to see the situation from a higher perspective and heal that issue of separation through the forgiveness of themselves and the other person. Then, as the healing of any issues occurs, they rise higher in consciousness within the spirit world. The mentality of 3D (the third density physical world) is SEPARATIVE in nature and 4D (the fourth density spirit world) is INTEGRATIVE, or healing, in nature. 3D resonates to the human solar plexus energy center, with its mental development and its competitive nature, while 4D resonates to the heart. The higher aspect of heart consciousness is the first stage of spiritual awareness. It is here that, as a principle, the good of the many is recognized as being more important than immediate benefits to the self. This leads to a sense of service where the person wants to help ensure that the best is available to everyone. This is the foundation of a world which is supportive rather than competitive. In such a world there really is more for everyone; much more, because the energy that was spent in competition against others is now funneled into productive work. At night, when you leave the awareness of your physical body behind, it is not because your brain has shut down for the night. It is because your attention has shifted into your spirit body. Your spirit body rises out of your physical body and prepares to begin your nocturnal adventures. Next, in Part II, we’ll take a tour of the spirit world and see what options you have for the best of nocturnal adventures. And, we’ll go on to discuss how to develop better dreamtime recall so that you can remember those adventures. Owen Waters is the author of Freedom of the Spirit: Four Powerful Steps to Spiritual Freedom. This entry was posted in Owen K Waters, Spiritual Dynamics, Spiritual Metaphysics on November 3, 2018 by Owen K Waters. Peace can sometimes be so far away, and inner bliss… even farther away. Take the time now to spend some real quality time by going within. Find that sense of peace that lies within. Visit the place where inner bliss dwells and waits patiently for your return. Let yourself unwind and compose yourself for a few precious moments of peace. Remember that your mind is much more far-reaching than your physical brain. Your mind, as consciousness, is nonphysical, while your brain is just the physical translator of your consciousness. Focus your mind away from the clutter of day-to-day living and turn your attention inwards to the peaceful core of your inner being. Then think of the deepest possible state of consciousness. And what could that state be? It is the state of consciousness known as Infinite Being. The word Infinite reflects the idea of ultimate, while the word Being refers to a state of awareness, rather than a doing activity. Infinite Being is infinite consciousness without a focus upon any specific activity. Infinite Being doesn’t have to do anything, it already is everything. It is important to appreciate that the state of Infinite Being is not “out there” somewhere external to us. Infinite Being encompasses all consciousness, including all manifestation. We are that consciousness, as is everything else in existence. In meditation practices, affirmations are often used to focus the mind. By simply repeating the words, “I am,” you affirm your true nature as consciousness. In the case of the Infinite Being meditation, we affirm our innermost identity as the ultimate, infinite consciousness. The affirmation “I am Infinite Being” is the most powerful affirmation possible within the English language. The phrase “I am Infinite Being” is an affirmation of your oneness with the ultimate potential, the source of all life, the consciousness from which all life sprang. You are one with that universal consciousness. Everything in manifestation is one with that universal consciousness. Now is the time to consciously affirm your ultimate potential. It may take courage to begin with, but the results are more than worth the effort. If you find issues arising, such as a feeling of unworthiness in your alignment with the ‘All That Is,’ with Infinite Being, just let those thoughts go, then gently bring your mind back into focus upon the affirmation. You do not have to justify the words, or settle any internal argument about them, just because of some prior conditioning as to how someone said you “should” think in this life. Think independently, think infinitely, and you will connect with the consciousness of your ultimate potential. Have the inner discipline to stay with the affirmation and let any issues fade away unchallenged. Your inner self knows the meaning of the words and resonates in joy with their exact and literal truth. Every time you make this affirmation, you become more connected with Infinite Being. Any lesser thoughts are then healed within the light of greater truth. Find a quiet space to sit down for a few minutes, close your eyes, and start looking for the quiet space within. To keep your brain occupied with the task at hand, focus your attention on the slow, even flow of your breath as it passes in and out of your nostrils. On the out-breath, simply allow your attention to follow the flow of air from your nostrils. To induce an immediate calming effect, allow each out-breath to take longer than each in-breath. Life energy, also known as etheric energy, is conditioned primarily within the human spinal column. From there it is distributed to the rest of the body via the subtle nervous system. Most key functions in the human body owe their operation primarily to the supply of etheric life energy, rather than to the supply of electrical energy. Etheric energy, like consciousness, is non-physical and yet it is behind all life. To help enhance the natural flow of life energy within your spine while performing this meditation it is preferable to sit upright in an erect chair. As you progress with this meditation, the natural flow of life energy within your spine will become enhanced, bringing an enlivened awareness to your consciousness. When distracting thoughts arise – which they will – treat them with patience and understanding. Put each distracting thought aside so that you can continue with the Infinite Being meditation. If a thought seems important or urgent, then it will be sure to return later, after your meditation session has finished. There are a number of ways to enhance your meditation experience. One is to reserve a small space, such as the corner of a quiet room, where only meditation is conducted. That space then becomes more conducive to a meditation environment. A small table or surface can be covered with items that you connect with spiritual practice. Candles and incense are especially useful as they provide some initial focus for the senses. It also helps to always use the same chair, one that is constructed primarily of a non-metallic material. Metal chairs attract etheric life energy away from you, which is great for the chair, but not so good for the meditation session. A small clock completes your setting, and clean, light clothing, reserved especially for meditation, further enhances the atmosphere. A shower or bath before meditation is very valuable, as water is a powerful cleanser. If, for example, you have just come home from a hectic day at work, then your energy body will be filled with the distractions of the day, stored in etheric energy form. The water that cleanses you in a shower or bath not only cleanses you of physical impurities, but, more importantly, it also cleanses the etheric energy impurities that do not belong in your energy body. The reason that water is such an effective energy cleanser lies in its chemical composition. Water consists of H2O – hydrogen and oxygen. Oxygen is not just a chemical that the body needs. Its greater role is to carry life-giving, etheric energy. When you shower, your etheric body is being washed with the water’s flow of cleansing, etheric energy. The best investment of your time each day is to spend 20 minutes in meditation. Make the time for this to happen. Make it the day’s first priority. The easiest habit to adopt is one which makes up the first activity of the day. Making it a routine will also reinforce the effects of the meditation. If you are hungry to the point of distraction before a meditation session, then have some light refreshment, such as fruit or juice. Conversely, a full stomach after a heavy meal will have a deadening effect upon the higher possibilities of your meditation session, so plan to eat any large meals at least two hours ahead. To quiet your daily brain activity by focusing on rhythmic activities that induce a spiritual focus. To affirm your connection to the highest possible state of awareness. To charge your system with additional life energy through controlled breathing. To create a Being Space, where your consciousness can move easily into the experience of your inner state of being. Take a few moments to completely relax your physical body. Sit in an upright chair with your eyes closed, then clench your feet, toes and leg muscles. Release the tension and let your feet and legs relax completely. Do the same clench-and-release process for your stomach, chest and back; then your arms and hands; then your neck and face. In preparation, take three deep breaths and exhale each one completely. Now focus your attention on the slow, even flow of breath as it passes in and out of your nostrils. On the out-breath, allow your attention to follow the flow of air from your nostrils. 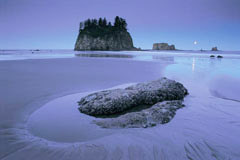 To induce an immediate calming effect, slow each out-breath and allow it to take up to twice as long as each in-breath. To make a space for your consciousness to dip into the experience of being, pause at the end of the out-breath. Hold the breath out of your body until you feel the need to inhale again. This will typically be for around three seconds, sometimes less. When you are in this motionless quiet space, don’t think, just be. Subtle impressions may arise from your inner self in this Being Space. The end of each breathing cycle is your personal communion space with your inner being. Ignore surface mental noise – words and feelings that jump into your attention – and maintain your focus upon the quiet inner space and subtle impressions of higher consciousness. Nothing loud comes from your inner being. Focus your awareness upon your inner silence. With practice, this is a time when great insights and inspiration quietly dawn upon your awareness. Repeat this cycle of breathing and being for 20 minutes. An effective meditation technique opens the door to more inspiration, love and creativity into your life. Happy surfing upon the realms of spiritual awareness! This entry was posted in Metaphysical, Metaphysics, Owen K Waters, Spiritual Dynamics, Spiritual Growth on October 13, 2018 by Owen K Waters. The legendary Fifth Element holds the key to the answer to one of today’s top mysteries in the worlds of physics and cosmology. Scientists estimate that 84% of the matter in the universe is composed of invisible dark matter, but they have no idea what it is. With a short venture into the world of metaphysics, you are about to find out the answer! In ancient Greece, all material things were said to be composed of a mixture of the four elements of earth, fire, water and air. There was also said to be a more subtle, fifth element. This was called the quintessence (literally, “fifth element”), implying its very delicate or refined state of existence. For many centuries, philosophers considered that all matter consisted of combinations of the basic elements in the Greek tradition. 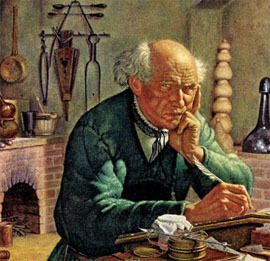 In the early 1500s, Philip von Hohenheim boldly renamed himself Paracelsus, meaning “beyond the medical pioneer Celsus” and came out with a counter-proposal. He declared that, instead of the old elements, all things consist of the subtle essences of elements that he called salt, sulfur and mercury. However, this only served to confuse the situation further as both theories did little to identify the basic chemicals that combine to form the enormous variety of compounds that are found in nature. Next, fast-forward to the Age of Enlightenment. 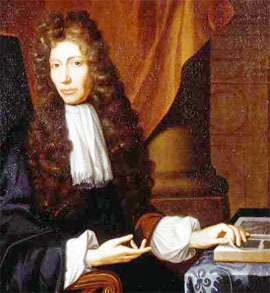 In the late 1600s, the early scientist Robert Boyle published The Sceptical Chemist, rejecting both schools of thought in favor of the then-novel idea that materials are composed of a variety of basic chemicals which, unlike compounds, cannot be further reduced by chemical operations. This demystified chemistry, laid the basis for its development as a science, and made possible the development of the table of elements that we use in chemistry today. As the science of chemistry developed and accumulated physical knowledge, however, it became focused entirely on physical materials and ignored the old idea of anything more subtle. The fifth element has been given various names in traditional Eastern thought and practices – such as prana, chi, qi, and mana – but it can be better understood by calling it vital life energy or etheric energy. From a physics perspective, the most concise term is etheric energy, which implies a more subtle energy than electric energy. When electric and magnetic energies combine in complementary motion, they produce physical light as well as the building blocks of physical matter. Your body is composed of electromagnetic energy. Etheric energy is actually more common in the universe than electric energy. Its manifestation, etheric matter, forms most of the matter in the universe. Cosmologists know that it exists, even though they can’t see it (hence the term, dark matter), because of its gravitational effects on physical matter in the cosmos. “Dark” energy and “dark” matter are roughly five times more prolific than their physical counterparts, so their influence in the cosmos is quite marked. The gravitational effect is a result of the fact that both energies – physical electric energy and the more subtle etheric energy – share a common interaction with magnetic energy. The magnetic energy component is provided by the ever-present fabric of space, which I term the God Field. By using the term the God field, we can reduce a common form of confusion that exists today. The God field was traditionally called the aether and, although that sounds a lot like etheric energy, the two are quite different. The God field is the fabric of space. It is a subtle, fluid, magnetic energy which fills all space. It is intensified within and around matter, where its attractive nature produces the force of gravity. Etheric energy, or vital life energy, is the primary energy of the universe. Electric energy is, by comparison, a secondary, more physical energy. Electric energy interacts with the magnetic fabric of space to form physical light and physical matter. Etheric energy interacts with the magnetic fabric of space to form etheric light and etheric matter. Etheric energy is a subtle, primary life energy, while electric energy is a physical, secondary energy. Both energies interact with the magnetic fabric of space, producing etheric matter and physical matter. The great advantage with knowing about etheric energy is that this vital life-giving energy holds the key to vibrant wellness. Vital life energy or etheric energy is present in all effective healing systems. In acupuncture, it is the “qi” energy that is enhanced or balanced in its flow along acupuncture meridians. It is the healing energy transmitted in distant healing. It is the same healing energy that is passed to the recipient in Reiki or Polarity Therapy. Vital life energy is the essence within sacred healing oils. It is the energy that flows into a person as they practice Qigong. It is the life energy in organic foods, in water exposed to sunlight, and in the oxygen that we breathe. Without vital life energy, we would not physically exist. With additional vital life energy, miraculous healings can occur. This entry was posted in Metaphysics, Owen K Waters, Spiritual Dynamics, Spirituality on October 6, 2018 by Owen K Waters. The mid-1960s through the mid-1970s were times of inner searching. The outside world came to be seen as materially-obsessed and insincere. If there was meaning in life, it was to be found within. The spiritual revolution in human consciousness had begun. In the United States, the ‘Baby Boomer’ generation refers to people born between 1946 and 1962. Today, ‘boomers’ form one-third of the U.S. population, 14% of which are metaphysical believers and seekers. These leading-edge thinkers emphasize inner spirituality and self-expansiveness. Their sense of self is that of a real, inner self rather than an outwardly-focused, ego type of self. The true, inner self is found in silence. The inner self is who you are. It is your soul. Your inner self is your personal link to the universe and to its source, the Absolute or Infinite Being. It is in this silence that you come to realize that everything in the universe is one, that separation is actually an illusion. In the light of this inner, soul connection, you also develop your sense of unconditional love for all of life and all of humanity. Over the years, as the boomers grew into career-making, home-making and raising families of their own, their attention became focused upon the demands of the outside world. Their spiritual awakening appeared to have been put on hold. Instead, in reality, their spiritual awareness was building strength while it waited to find expression in the outer world. 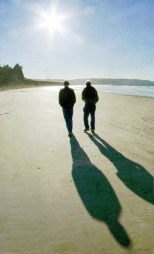 By the 1990s, boomers were seeking to express that spirituality within their lives. In the period 1990-2003, for example, 25% of British adults in the 30-59 age group deliberately downshifted. This means that they made voluntary choices to better their health and family lives, even though such choices meant earning less money. The 1990s saw the holistic lifestyle blossom and grow to include three times more people than before. Mind, body and spirit became the new mantra of holistic living. If something is good for your mind, body and spirit, then it is, by definition, good for the whole you. The New Awareness today focuses upon gaining inner knowing through self-realization and self-development. It fosters spiritual self-reliance without the imposition of standards or duties by an external authority. With the New Awareness, your true, inner self is your authority. Your sense of responsibility becomes powered by love rather than fear. You do no harm to others because you love your fellow human beings, not because you fear judgment and punishment. Your spiritual awareness grows into spiritual adulthood. You no longer need to be told what to do, how to think, or what your place in life ‘should’ be. Each person’s inner self is cultivated and treasured for its uniqueness. There is always potential for self-improvement, always potential for creating a better life. Along with inner development, comes a clearer sense of intuition or insight. Suddenly, with better insight, a person’s options in life become crystal clear. With insight, you easily identify the best course of action to successfully meet any challenge. With insight, also comes synchronicity. Life begins to fold around your envisioned plan of action, supporting it by providing opportunities and resources just when they are needed the most. ‘Quality of life’ is the new standard replacing the old ‘standard of living.’ Well-being of the whole self is paramount. Helping other people, being of real service to the world, is a natural desire which unfolds as your sense of inner connection strengthens. Your self-esteem is boosted and healed in the knowledge that every person has a unique gift to offer the world, the knowledge that you’re going to deliver that gift, and that you’re going to love doing it! This entry was posted in Metaphysics, Owen K Waters, Spiritual Growth on September 22, 2018 by Owen K Waters. Hurricane Florence, with its winds churning at 140 mph, was predicted to be a Category 4 or 5 hurricane by the time it made landfall on the U.S. east coast. Thank you to everyone who responded with prayers and healing light as the hurricane came ashore. The intensity of the storm was much lighter than expected thanks to the thoughts and prayers of lightworkers everywhere. Florence made landfall as a Category 1, with winds much reduced to 90 mph. Most of the mortal danger from Hurricane Florence is now over. What remains is further risks from flooding all the way up the eastern U.S.
As the people affected move into recovery mode, they face the possibility of devastating and heartbreaking losses along with a long and frustrating road toward repair and some semblance of normalcy in their lives. 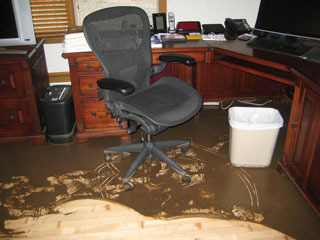 My muddy office floor after the floodwater came and went. In 2013, I experienced loss in a flood, with evacuation to hard-to-find hotel rooms, personal injury from lifting heavy items, and power outages. Then followed a long struggle to replace flooded appliances, floor coverings, swollen floorboards and soaked walls in an area where everyone needed help all at once. Floods are no picnic. They drain the human spirit beyond belief. Today, we can send our love and light to support the rescue and recovery efforts of all those affected by this monumental storm. You can use your own technique, or any method of raising the energy of the intended target area. For example, Tom T. Moore, author of The Gentle Way, recommends asking your guardian angel for help, both in personal challenges and to help others in need. (2) They co-create this in the physical realm by saying the request physically out loud or by physically writing it. Sit upright with your eyes closed. Make a spiritual connection, one which includes gratitude for life. Intend world healing by visualizing the desired positive outcome. Breathe in life energy with each inbreath. On each outbreath, repeat your intention and send a beam of white light from your heart to your intended recipients as a whole. Whichever method you choose, everyone will benefit – both the recipients of your light and your own spiritual evolution. This entry was posted in Owen K Waters, Spiritual Growth on September 15, 2018 by Owen K Waters.